On Monday, Drowned in Sound founder Sean Adams (read our two-part interview) reveals that The Daily Mail and other publications are guilty of stealing and re-running "significant" parts of a massively-popular interview of Paul McCartney that ran last week, in some cases without attribution, in all cases, without providing a link to the source, and in many cases, doing so in a way that he says paints a falsely-negative picture of one of the greatest musicians of our time. Publications lift quotes from each other all the time. The better ones provide attribution as to where the quote came from. The best include a link too. All of them should at least get the facts right, if they're stealing a story - it's the least they can do. The Daily Mail didn't link back; other other publications that grabbed "significant chunks" of the interview for their own articles didn't attribute the source of this rash of fresh quotes from a Beatle, says Adams; and not only that, but he says they also warped McCartney's words, painting him as a drunk, unable to write songs following the Beatles' breakup. "At no point does he say he had any problem writing," points out Adams. "Quite the opposite, in fact." This appears to be the passage in question: " …If I would have a writer's block, I look back now and can say that was the over-stimulation," says McCartney in the interview. "I'd be getting like ‘heeyyyy, nice and fuzzy' and it's not a good thing to write. Least for me it's not. Me and John [Lennon] were always very straight when we wrote, and it was normally in the middle of the day when you had your wits about you." First, anyone gets depressed when their band breaks up. If that band was the Beatles, one would understandably have more grounds to be upset, even as one retreated to one's Scottish castle. McCartney admitted to Drowned in Sound that struggled with the bottle during that period, which should come as no great surprise. 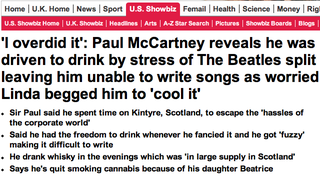 But that didn't stop The Daily Mail and other publications that lifted chunks of Drowned In Sound's interview from painting the former Beatle as having drunk himself into an inability to write songs. "Consulting lawyers and entering into legal proceedings against The Daily Mail… this is an odd start to the week," wrote Adams on Facebook on Monday. "[The Daily] Mail published a significant chunk of an interview we ran, re-presenting what was said massively out of content. Might have to do the same with The Sun, Yahoo and The Express too, who've also taken quotes from our Paul McCartney interview massively out of context and not even bothered to attribute the source." We're not experts on the British legal system, and don't want to dwell to much on the "he said she said" aspect, but Adams might have a case. The Daily Mail did lift large chunks of the interview, and European law includes a "moral right" that protects creators when others make unwanted use of their creations. Either way, this could be entertaining to watch - not only because of McCartney's legendary stature, but because a website is accusing a print newspaper of lying, stealing, and other poor journalistic practices. "It's not the first time something like this has happened, but it's certainly one of the most brazen and misleading, not to mention the huge percentage of our editorial that has been re-run," said Adams. "I honestly can't believe some of these places re-reporting the story with no attribution to the source - a lot of which is literally just copy-pasting the original, and a lot of the 400+ results on Google News just seem to be pulling in an RSS feed. The internet is a grotesque place." As an aside, might we suggest that Sir Paul drink enough to get with the program put his former band's music on MOG, Rhapsody, Rdio, and Spotify? After all, it's already been a year and a half since the band finally embraced 2003 and started selling music online.